Welcome to Kool Kingdom, the only place to go for the most popular collectable cards. We stock the full range of Yu-Gi-Oh!, Pokémon, Cardfight!! Vanguard and Magic Decks, Boosters, Collectors' Tins, Fat Packs, Albums, and lots lots more - all at unbeatable prices. But our real speciality is Yu-Gi-Oh! Single Cards, as well as Cardfight!! Vanguard Single Cards, with massive stocks, huge ranges and great prices. Come and see! SPRING SPECIALS! GREAT DISCOUNTS OF UP TO 15% ! We have some awesome Spring discounts on site - just enter Coupon Code 'SPRING5' (all in upper case) to earn a further 5% off your whole order as long as you spend just £5; 'SPRING15' to earn 10% off as long as you spend at least £15; or 'SPRING45' to earn 15% off as long as you spend at least £45!! Spend thresholds exclude post and packing. Retail Customers Only. Click Here to go to our New Items Section for Boosters, Theme Boosters, Planeswalker Decks and Bundles. Cardfight!! Vanguard: V EXTRA Booster 4  The Answer of Truth Includes 68 cards (3 VR, 6 RRR, 8 RR, 14 R, and 37 C) + 6 Parallel cards (3 SVR and 3 OR) Each display includes 1 VR or SVR. Each display includes 12 packs. Each pack includes 7 cards, two of them being R or greater. Includes support for the Genesis, Gear Chronicle and Great Nature clans. Team Up releases on February 1st and is the ninth main expansion of the Sun & Moon Series. TAG TEAM Pokemon-GX are here, brand-new cards that feature paired-up and powered-up Pokemon! The Pokemon TCG: Sun & Moon-Team Up expansion offers many amazing battle teams including Pikachu & Zekrom-GX, plus Lycanroc-GX, Hoopa-GX, Cobalion-GX, and more! Click here to go to our New Items Section. 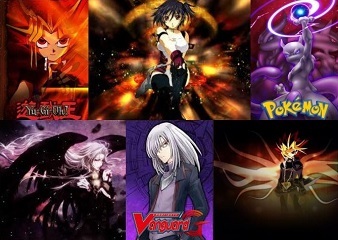 Savage Strike Features includes cards used by Yusaku Fujiki, Skye Zaizen, Varis, Takeru Homura and Zigfried von Schroeder. Includes new members and/or support for the Borrel, Cyber, Elemental HERO, HERO, Impcantation, Knightmare, Madolche, Neo-Spacian, Neos, Orcust, Prankids, Rokket, Salamangreat, Shiranui, T.G., Trickstar, and World Legacy archetypes, as well as the Guardragon series. FREE GIFTS IF YOU SPEND MORE THAN £5 ! We are giving away fabulous free gifts as long as you reach our minimum spend levels and have not used a discount coupon instead. Please remember to place an actual order for these items by clicking on the link!. Spend level applies to actual value of one individual order (incl VAT) before Post and Packing . Offer cannot be used in conjunction with any other free item or any discount coupon offer. Not applicable to wholesale customers. KOOL KINGDOM IS BUYING YUGIOH CARDS! TURN CARDS INTO CASH! We are interested in popular 100% Mint single cards that you may have to sell as well as whole collections. The more cards we have in stock, the more we can hold our prices down, which we believe is good for the game. We are interested in the most popular and hard to obtain cards and we will pay up to 40% of our current site prices (net of VAT) for cards showing as back order or out of stock. In stock cards will be offered at 10% of the site price. Commons and Rare cards will be offered at blended bulk rates only, irrespective of value, to keep our processing costs down. These bulk rates are detailed in our full Terms and Conditions. If you have cards that you'd like to sell, then please e-mail us at info@koolkingdom.co.uk and include your phone number. Please see our terms and conditions for the full conditions. These terms and conditions form the entire agreement between us and override any offer made or other correspondence between us. By sending your cards to us you are agreeing to these full terms and conditions, so please ensure you have read them first.